Dare I say it, summer has FINALLY arrived in the UK. It may have taken a while and Autumn may be around the corner, but whilst it’s here in full swing it’d be rude not to enjoy it to the fullest and make most out of your summer wardrobe. Short skirts, swishy dresses and ripped denim shorts? YAS PLS. The One That Teleports You To A Tropical Garden: Evolve Organic Beauty Tropical Blossom Body Polish – £20 via Naturisimo. You can see that this tub has been very very well loved, and with good reason. It’s an oil based, 100% natural and 93% organic body scrub that contains organic sugar particles and turns into a milky lather once in touch with water that leaves your skin nourished but not greasy. The scent of this is one of the reasons why it’s one of my current favourites, as it temporarily transports me to somewhere tropical, thanks to the blend of Tahitian Coconut Monoi, Hibiscus and Gardenia. The One That Detoxifies and Smells Like A Lemon Tree: Tosé Apothecary French Clay and Lemongrass Detoxifying Body Scrub – from £15 via Tosé Apothecary. If you’re not a fan of citrus, shy away from this one, as Lemongrass and Lime are the top notes in this delicious product. Based on fine Dead Sea Salt Crystals, Epsom Salt and French Clay, it detoxifies and restores the body and muscles. Epsom Salt is particularly great for sore and tired muscles, so I love to use this after a workout. It also contains a blend of Vitamin E, Ylang Ylang and Lavender, to close the full circle of it being nourishing, relaxing and a true at-home spa experience. The One That Brings A Turkish Bath House To Your Bathroom: L’Occitane Rebalancing Black Soap – £20 via L’Occitane. This was all the hype when it first launched 2 years ago and I don’t understand why no one is talking about it anymore. Black soap is essentially an olive oil based paste that cleanses and detoxifies the body (yes, there’s a trend going on here). It smells super relaxing as it’s blended with Eucalyptus Oil for a true hamman experience. Apply it all over your body and use a damp mitt to buff the skin, leaving your body soft and silky. The One That Technically Isn’t An Exfoliator: Mio Skincare The Mio Body Brush – £14.50 via Look Fantastic. Body brushing used to be all the rage, but somehow has kinda been brushed (soz) under the carpet these days. Not only does it stimulates blood circulation, it also activates cell renewal and reduces the appearance of cellulitis if you do it frequently. Who can say no to firmer and smoother skin?! I’ll be honest, it’s not the fastest or easiest method to exfoliate, but it’s the one that does have multiple (health) benefits to it. Brush on dry skin in long strokes towards your heart, pre-shower. 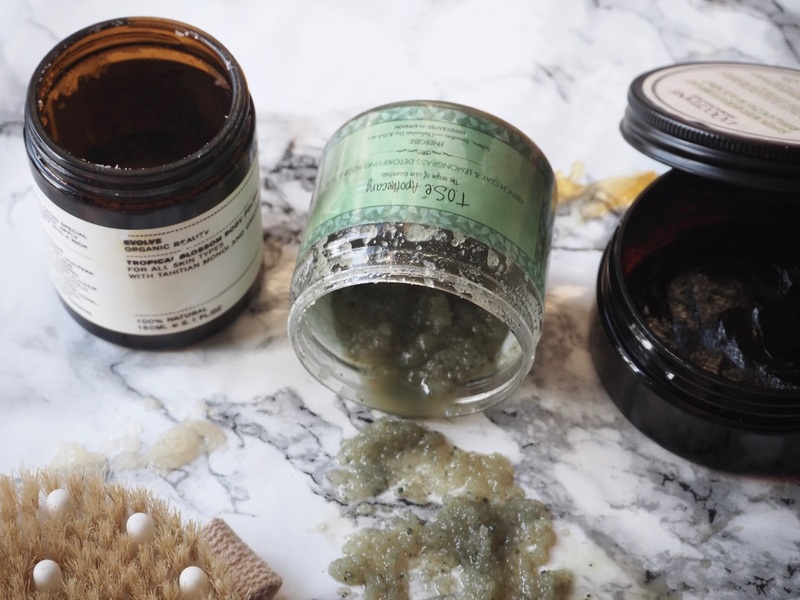 The One With Health Benefits And That’s A Mouth Full: REN Atlantic Kelp and Magnesium Salt Anti-Fatigue Exfoliating Body Scrub – £26 via Space NK. (Not in shot —I hid it away so well from prying hands that I forgot where I left it. Update: found it). It’s no secret that I love REN. It was one of the first natural cosmetic brands that I tried and that converted me to the green side. Their newly launched Kelp & Magnesium range doesn’t disappoint either. Its entirely based to detox, revitalise and re-energise the skin & mind. Kelp in particular is great to fight fatigue, stress and pollution and Magnesium (extracted from Plankton) relieves muscle ache, aside from a list of other benefits. Of course, the benefits are much grander when absorbed directly into the body, i.e. when you digest it, but Magnesium is one of the minerals that your body can absorb through the skin. FYI: If you’re using oil-based scrubs, I’d recommend exfoliating the night before application – or in the morning of – as they tend to leave a slight film that may cause the fake tan to slip. Happy exfoliating!